UPDATE – We made this a second time with Sea Scallops instead of Bay Scallops and it was much better. We seared the scallops rather than sautéing them – and we didn’t use dill, because we forgot… all this proves that you can mess around with a recipe and get new flavors and ideas each time. Enjoy! In a large saucepan, heat the olive oil over medium heat. Meanwhile, heat the chicken stock on a nearby burner over medium low heat. Add the onions to the olive oil, and cook for 3-4 minutes, or until soft and translucent. Next, add the rice, stirring constantly to coat the rice in the olive oil. After about 2 minutes, add the white wine, and stir. Once this has been absorbed, add 1/2 cup of the chicken stock. Stir constantly until this is absorbed (should take 3-5 minutes) and then add another 1/2 cup. Continue in this fashion until all of the stock is gone. Zest your lemon in between stirring. At the end, add the lemon zest and the cheese and stir some more. Somewhere at the beginning of your risotto stirring, combine the mustard and the milk in a small pan, whisking together over medium low heat. Keep this cooking while the risotto cooks. You want to reduce the mustard sauce until it is about the same viscosity as its original consistency. Somewhere towards the end of your risotto stirring (with about a half of a cup left of stock), heat the olive oil in a skillet. 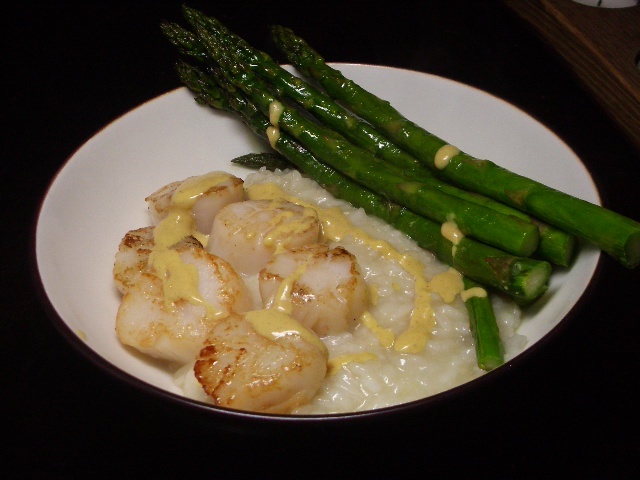 Saute your bay scallops (or sear your sea scallops) along with a little salt for 3-4 minutes. 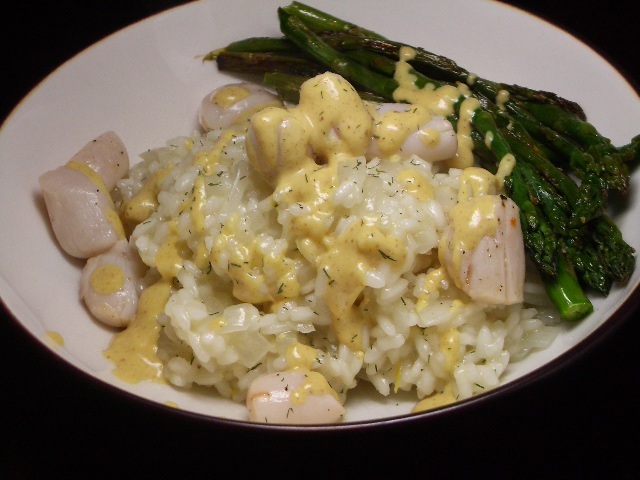 When you’re ready to serve, dole out the risotto in bowls, then add the scallops, followed by the dijon cream sauce and finally, sprinkle with the dill. ENJOY! *As you can see, we also serve this dish with some oven-roasted asparagus in the bowl – an excellent accompaniment.